In the 70s, Henry Barber would show up in the Valley for a few weeks and snag a handful of classic, cutting-edge routes right in front of the astonished local climbers. Butterballs was one of Barber?s many prize picks. This route ascends steep finger locks with occasional good edges for the feet. Move quickly and stay close to the wall using your feet wisely. A wide finger section with poor feet proves especially challenging to those with thin fingers. Flaring thin hands in the pod are more difficult than expected and the finish is steep with secure liebacking. 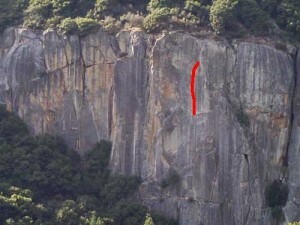 Most climbers toprope this climb before feeling solid enough to hang around and place protection on lead. Which SuperTopo guidebooks include a topo for Butterballs?